The Imperial Japanese Navy had an interest in transport submarines, having seen how the German U-155 Deutschland operated during the First World War. Following the Battle of Midway, the IJN began development of their transport submarine, the Type D submarine. The I-361 class had eleven boats built between 1943 and 1944, and most were lost during the war. A handful survived, but all were eventually destroyed or scrapped. Five of the I-361 class were converted to Kaiten mother ship submarines, designed to carry the Kaiten suicide attack submarine. The I-365 was started on May 15, 1943 at the Yokosuka Naval Arsenal. It was launched in December 17, 1943 and entered service with the IJN on August 1, 1944. The I-365 was one of the few submarines that was not converted into a Kaiten mother ship, so it operated in the standard transport role. On November 28, 1944, the I-365 was sunk by the USS Scabbardfish off the coast of Japan near Yokohama. Aoshima produces some very nice kits of submarines, and this one is no exception. 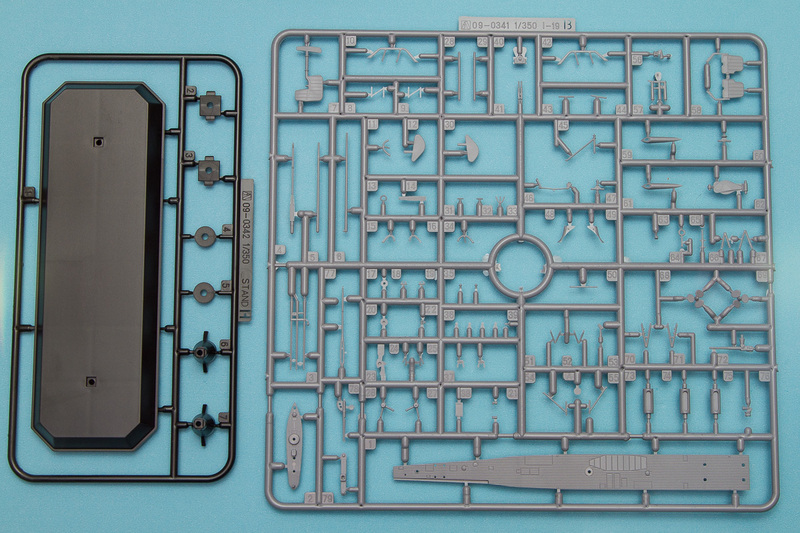 Molded in their typical light gray plastic, this kit has excellent surface detailing throughout. 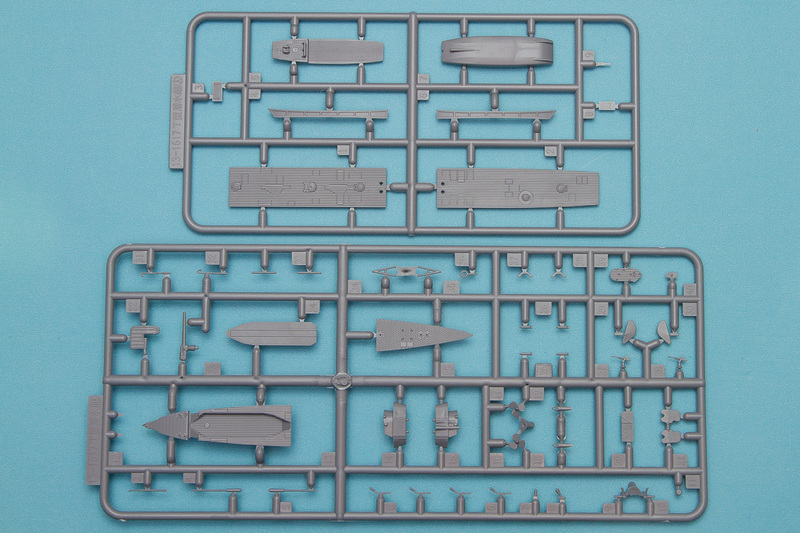 As this is not the only Type D submarine Aoshima has produced, there are quite a few parts marked not for use, so be ready to add a lot to your spares box here. The small decal sheet provides the minimal markings found on the I-365. Building this sub is more complex than most 1/350 submarine kits. 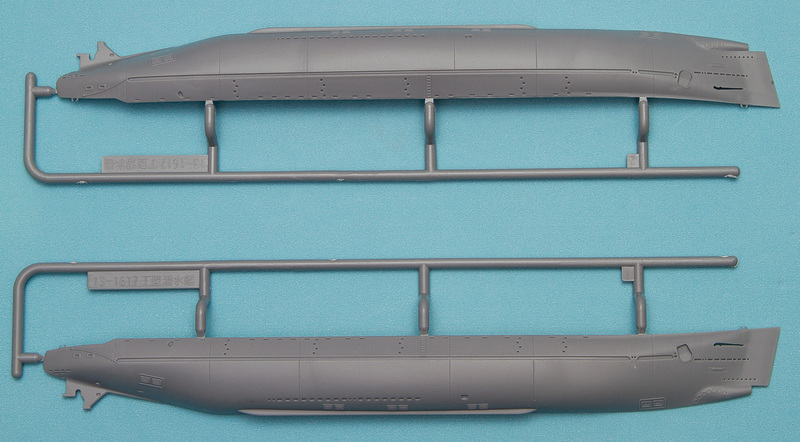 The hull is built up from two main side pieces, with separate upper decking parts. To ensure that the hull is a solid construction, the kit comes with several inserts for both rigidity and to support the stand. If you plan on using the kit stand, do note that you'll need to hollow out a couple of flashed over holes on the underside. While on the underside, the screws and shafts are separate, with separate pieces for the supports and fairing. The rudder and rear dive plane is also separate. For the sail, this is made up from quite a few bits as well. There's the main deck piece, on which goes various bits including snorkels, periscope, and observation binoculars. This completed assembly is then sandwiched between the two main sail pieces. With that assembly done, the main hull deck is next. The main hull deck is made up from four main pieces, with two additional inserts on the aft end. For the most part, the breaks fall in areas that are logical or are hidden, but there will still be a couple of spots where you'll have to work the seams a bit. 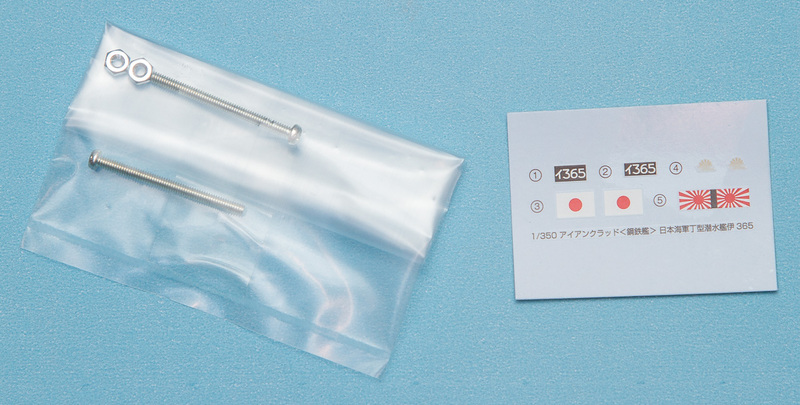 The instructions also indicate that you'll need to drill out several holes as well, so be sure to read the instructions here. With the main hull together, you can add the sail and all the other details. The latter includes two small deck guns and one large gun, plus various supports and such. The forward dive planes are separate, as are the anchors, and the final little addition is a small landing ship that sits atop the rear deck. You're on your own in terms of railings and finer details, although Aoshima does produce both a photoetch set and a wood deck set for this kit. Painting is about what you'd expect for a Japanese WW2 submarine. The hull underside is painted in red, while the upper half is gray. The deck is wood colored, which will add a nice bit of contrast to the build. The decal sheet provides a flag, I-365 numbers, and a couple other small details. 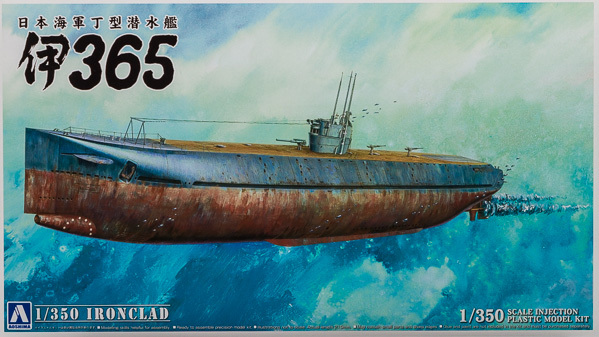 The growth of 1/350 submarine kits has really taken off in the last few years, and it is great to see this expansion cover the Japanese World War Two subs. This is another nice release from Aoshima, and for those interested in WW2 submarines, you'll want to pick this one up. My thanks to Dragon Models USA for the review sample.